The ordinance applies to supermarkets, grocery stores and pharmacies and retail stores with a limited line of food related items such as snack foods or groceries and liquor stores. Outdoor venues such as swap meets, farmers markets, street fairs, restaurants, fast food establishments are exempt from the ordinance. Retail stores would be required to report the total number of paper bags provided and the total amount collected and provide a summary of the reusable bag promotional efforts. Customer receipts must show the number of paper bags provided and the amount charged. If the ordinance is adopted, the effective date is January 1, 2015 for large retail stores with at least 10,000 square feet of floor space and July 1, 2015 for smaller retail stores. Mr. Olson, went on to explain that the ordinance would be implemented by the Public Works Department Sustainability Division which will perform Outreach, education, and participate in store events (i.e. reusable bag giveaways). The cost for this effort would be $12,000 per year for the first two years and $1000 per year after 2 years. Non-General Funds from the Waste Diversion and Recycling Budget would be used. He went on to say that Public Works staff had visited more than 60 small businesses as part of their Outreach effort. Mr. Joe Yahner, from the City of Ventura Environmental Sustainability Office, discussed the BEACON Final EIR and the city prepared addendum, and stated there were no significant impacts. He went on to discuss California Senate Bill 270 (SB 270) a statewide Single Use Carryout Bag Bill on which a vote is expected later this summer. SB 270 is similar to Ventura’s ordinance and has an effective date of July 1, 2015 for large stores and 1 July 2016 for all other stores. The presentation concluded with Alternatives and Recommended Actions. 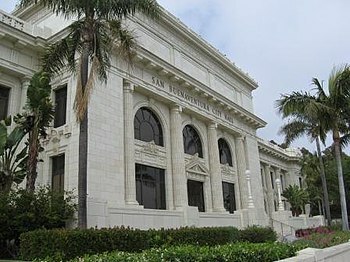 Two alternatives provided by the city staff are: (1) Postpone consideration of proposed Ventura Ordinance until the outcome of the statewide Single-Use Carryout Bag Bill (SB 270) is known; and (2) Modify the proposed ordinance, knowing that significant modifications may require a new EIR. The Recommended Actions included the following: (a) Introduce and waive the first reading of the ordinance amending the Municipal Code to add Chapter 6.800 “Single–Use Carryout Bags at certain retail food and grocery store establishments”; (b) Adopt a resolution certifying the BEACON EIR for a Single-Use Carryout Bag Ordinance; (c) Adopt a resolution approving the addendum to the BEACON EIR prepared by city staff and dated May 1, 2014; and (d) Set the proposed ordinance for a second reading and adoption at the city Council meeting of June 2, 2014. After conclusion of the public comment period, Mayor Heitmann turned the meeting to the council for discussion. Councilmember Carl Morehouse stated that he did not have a lot of faith in the state passing a statewide bag ban. “People in this community are environmentally conscious and forward looking. I recommend that we move ahead with staff recommendations (a) through (d)”. The move was seconded. Councilmember Andrews indicated that the last time they had discussed the ordinance, that he would not support it, if it contained the 10-cent paper bag fee. I feel the fee is exorbitant. “As I read through the EIR, I find that there are assumptions made about the effectiveness of the ban that have no empirical support in the EIR. They are footnoted, but the footnotes simply refer to other reports that made the same assumptions. And the text of the report clearly identifies these numbers as assumptions. But even if you accepted the assumptions , and that would mean that there would be 17 million paper bags issued at 10-cents each would be a $1.7 million windfall for the stores. There is no evidence presented that the stores would use this money to support this program. Indeed, when I made my own checks for the cost of bags and found it was nowhere near this amount of money. I can buy bags in small quantities on the internet for a 1.5-cents each. I can’t support this motion for this reason. Deputy Mayor Nasarenko stated he was in support of staff recommendations and in support of an ordinance to ban single-use plastic bags. Councilmember Mike Tracy stated that he has come full circle on this issue. He stated that over the years he realized that some kind of regulation concerning plastic bags is in order. He would not support this issue at this time although he acknowledge that it will eventually happen. He stated that earlier in the evening, on a different agenda item, that the council was agonizing over a few thousand dollars in the budget and this ordinance requires spending $24,000 in the first two years to educate the public. Of the hundreds of state laws passed every year, I don’t remember the city ever having to educate the public. For that reason, I will not support the ordinance. Councilmember Monahan stated he feels it is premature to act on this program and wants to wait for the state to act and supports delaying this issue to a later date. Mayor Heitmann stated that she supported the ordinance because it is time. She also had questions about the 10-cent fee and wants to make sure stores use it to support the ordinance. She want the city staff to interface with the stores and encourage them to use it for education and to provide reusable bags with their names on it as a form of advertisement. Mayor Heitmann called for a vote with Mayor Cheryl Heitmann, Deputy Mayor Erik Nasarenko, and Councilmember Carl E. Morehouse voting in favor of the ordinance and Councilmembers Neal Andrews, James Monahan, and Mike Tracy voting against adopting the ordinance at this time. The tie vote means the measure did not pass. A motion to bring the item back for reconsideration after the state legislative session ends was approved by a unanimous vote. Had it not been for the absence of Councilmember Christy Weir due to illness, the Single-Use Carryout Bag Ordinance would more than likely have passed. Hence, Venturans have been spared from a plastic bag ban that imposes someone else’s solution to a problem on everyone else. I remember having several conversations via email with Rick Cole. He guaranteed that the Sustainability department was only one person transferred from another position (no additional cost). Now I am seeing it is a “Force”, as I knew it would be. Sad that not one of them really seemed to understand the true reasoning for the bans. Neal alluded to them, but no one else did. Good update Tony! Appreciate knowing the positions of the city councilmembers.